It’s not one hundred percent pest proof, but it’s pretty darn good. While our brassica mix attracts flea and cucumber beetles like none other — which I found interesting, since it’s considerably more spicy and slightly tougher than this mix — our awesome Johnny’s Seeds lettuce mix is surprisingly resilient and mostly beetle-free. It’s got lots of fancy-sounding varieties in it (Rouge D’Hiver, anyone?) but mostly it boils down to: curly red, curly green, (both of which are great for loft, i.e. 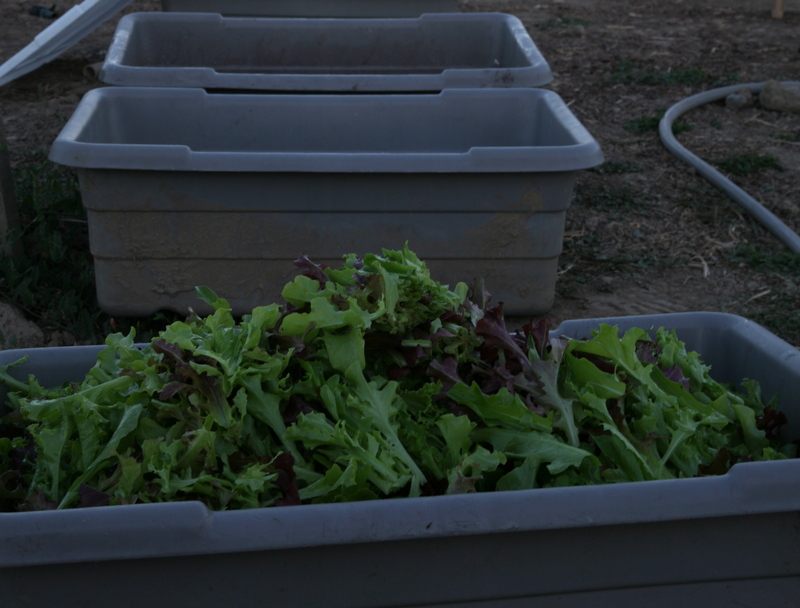 fluffing up your salad bags), flat red and flat green. All are quite beautiful, and the “flat red” are slightly mottled — a beautiful red-and-green color blend. Main thing to watch for this with this crop: weeds. (You can spot a few grasses and one wild mustard in the photo above.) But if you’re growing for home use, the weeds shouldn’t be too big of a problem — if you’re picking on the scale of one dinner at a time, you can easily pick them out while washing the leaves. For a commercial scale (even a small one), we have to spend a couple of hours a week pulling out mustards and grasses… otherwise it’s a painfully slow harvest, come Saturday morning, as we pull weeds out of each handful we snip. One other thing to watch for, thanks to the overhead misters: slugs, which love all things damp. I’ve caught a few on the leaves, but they were really small, and I haven’t noticed too much slug damage. Note: the organic version of this mix is called “Encore,” and the conventional is called “Allstar.” The conventional is considerably cheaper, and I think we settled for that the second time around. We always go for non-treated seeds, but I’m still torn about whether or not the seeds themselves need to be grown organically. Yes, I obviously believe in organic agriculture — but in terms of my end product, how much can one lettuce seed carry in terms of residual chemicals, etc? 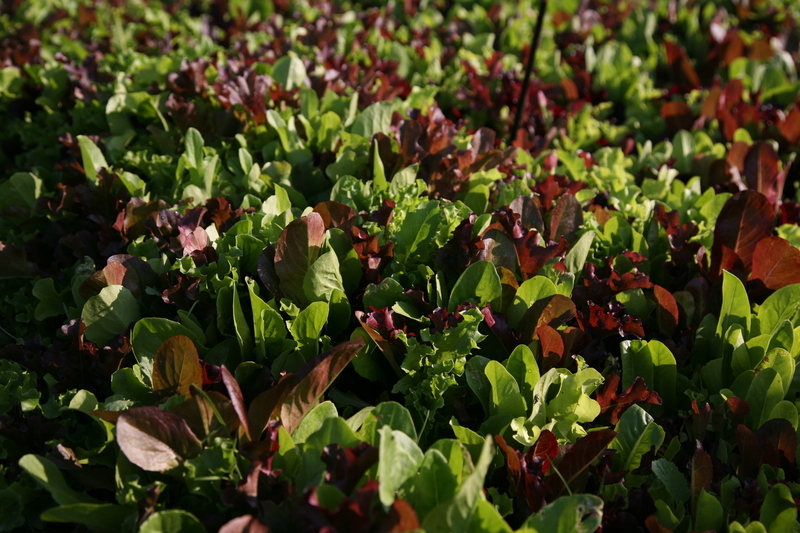 If the lettuce you’re eating is grown with only organic inputs, isn’t that good enough? Hopefully in the future we’ll be saving our own seeds, eliminating this discussion altogether — but it’s still some food for thought.